Sreeni’s SPANDAN 2014 culminates with a bang at IHC – Media Coverage! 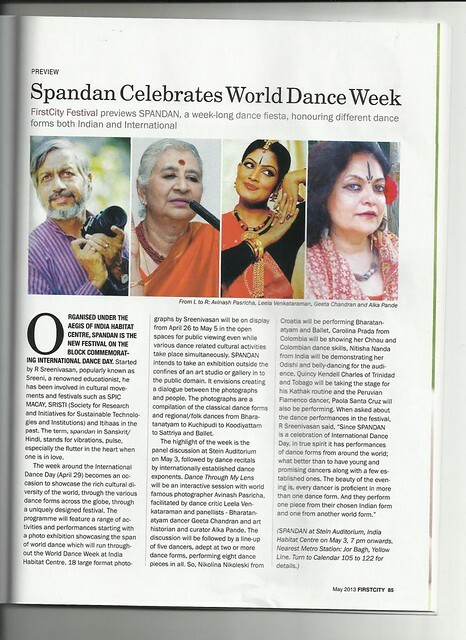 SPANDAN 2014, a brainchild of R. Sreenivasan and Indira Ganesh, was painstakingly and lovingly compiled. 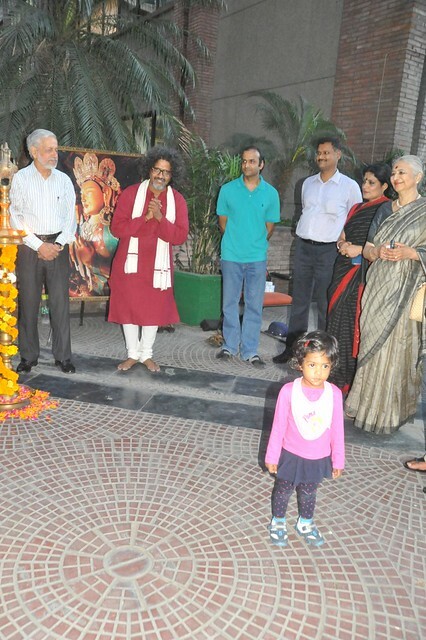 It is all about celebrating the ‘Journey of INFINITY’ as Sreeni calls it – discovering the infinite potential within. With love towards performing arts and fine arts, Sreeni intends to inspire every youth to push oneself in their areas of passion and excel in life. While the Dance Photography Exhibition with over 30+ photographers celebrated that ‘Journey of Infinity’ of the dancers who have made a difference, the Dance Evening celebrated the young and not so young dancers who are on their way to establish themselves in the world of dance. 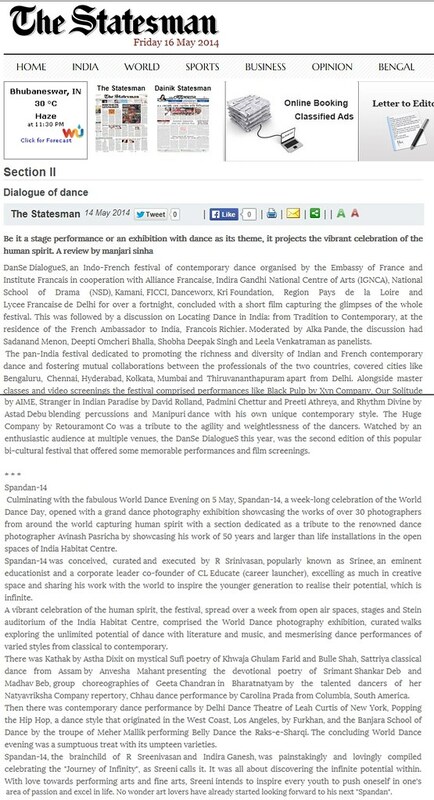 It gave Sreeni, immense pleasure to welcome each viewer and every youth to the second edition of SPANDAN – a celebration of human spirit in the form of dance, generously supported by INDIA HABITAT CENTRE (IHC) and CL EDUCATE, earlier known as Career Launcher. 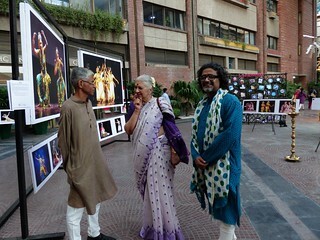 It was heartening indeed to interact with scores of youth, elders and intellectuals apart from dancers and dance lovers during the SPANDAN Photo exhibition and the dance evening. Here are a few coverages of SPANDAN in the media…. if you want to read the original article in the respective English publication, kindly click on the article here. Indeed the 4 weeks of craziness to get SPANDAN going and the 10 days of event culminating with the dance evening! …..the intensity has been elevating and enervating too…helping me to discover more and more of me in the Journey OF INFINITY…. My humble bow to each one of you who has facilitated me to put the entire SPANDAN 2014 festival. I am sure the festival has ignited in every visitor and audience a desire to excel in life. Kindly pardon me for all my inadvertently committed mistakes. More action on plate now, as I cruise ahead in my journey….on CL front and HOME front too.. keep watching! Looking forward to your blessings for life. The Curtain Raiser of SPANDAN introducing the three dancers – Nikolina, Carolina and Nitisha Nanda appeared on Rajya Sabha TV. The complete program is scheduled to come any time in the near future. The first segment of the SPANDAN world dance evening had an interactive session with Eminent photographer Shri Avinash Pasricha anchored by Mrs Leela Venkataraman, eminent dance critic and Mrs Geeta Chandran, celebrated Bharatanatyam dancer. I loved conceiving this unique festival and bringing it to you. Looking forward to bettering it every year. Kindly leave your feedback so as to help me.